Rat astrocytes (RA) are derived from rat cerebral cortex. 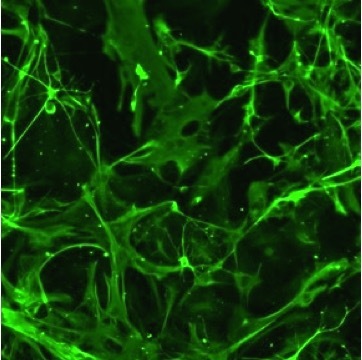 Astrocytes are the most abundant cells in the central nervous system where they perform many functions, such as providing mechanical support and nutrients to neurons and removal of wastes from neurons; providing signaling to endothelial cells; regulating neurogenesis and controlling synaptic function. As the recognition of the importance of astrocytes in nervous system is increasing, RA serve as a useful in vitro model for exploring the diversity of astrocytes functions. 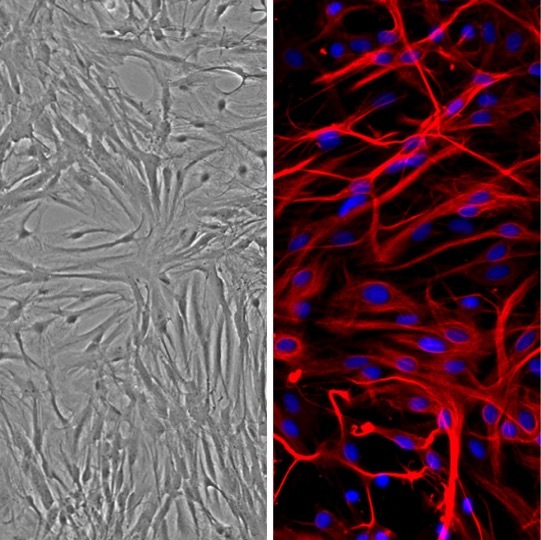 (Click to Enlarge) Cryopreserved Rat Astrocytes (RA) revived and cultured in Complete Rat Astrocyte Growth Medium (L). RA stained for GFAP (in red) and DAPI (in blue) (R). McCarthy, R. and D. Kosman. 2014. Glial Cell Ceruloplasmin and Hepcidin Differentially Regulate Iron Efflux from Brain Microvascular Endothelial Cells. PLoS ONE, doi.org/10.1371/journal.pone.0089003. Liu, S., G. Zhen, R.C. Li, and S. Dore. 2013. Acute bioenergetic intervention or pharmacological preconditioning protects neuron against ischemic injury. Journal of experimental stroke & translational medicine. 6:7-17. McCarthy, R.C., and D.J. Kosman. 2014. Glial Cell Ceruloplasmin and Hepcidin Differentially Regulate Iron Efflux from Brain Microvascular Endothelial Cells. PloS one. 9:e89003.